www.hubertherrclocks.com is a retail division of OWI. We are a fsmily owned and operated business and take pride in offering high quality Black Forest cuckoo clocks at a very competetive price. Alllour cuckoo clocks are imported directly from the manufacturer in Germany and most of them are in stock in our US.-warehouse. All cuckoo clocks carry a certificate of authenticity, they are made by highly respected german clockmaker Hubert Herr.We deal with cuckoo clocks professionally for over 10 years, we know our product and are able to help you out with any problem you might have in the future. Most of our cuckoo clocks are in stock in the US, therefore we are able to ship your cuckoo clock to you quickly. All our cuckoo clocks are backed by a 2 year no hassle warranty. We will not refer you to a 3rd party service station in a warranty case, where you have to pay for shipping and wait a long time to get your clock back, but will arrange for shipping at our expense during the warranty period, and have it repaired by our in house service station. Even after your warranty expires, you will be able to benefit from our experience and close relationship to the manufacturers. We will assist you on the phone for your service and trouble shooting questions, or order rare replacement parts for your cuckoo clock at wholesale price. 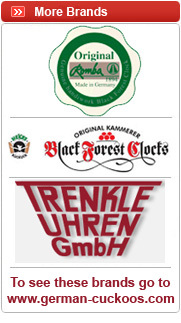 Every cuckoo clock in our store is not only "Made in Germany" but also certified by the Black Forest Clock Association. A certified original Black Forest Cuckoo Clock has to be hand carved, operate mechanically, use mostly parts manufactured in the Black Forest and has to meet the high quality standards set by the Black Forest clock Association. 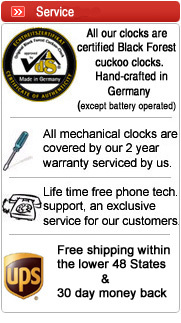 All our german cuckoo clocks meet or succeed these standards. We chose only manufacturers, who use high quality german brass movements by Hubert Herr or Regula to ensure your Black Forest cuckoo clock will run for decades. All our musical cuckoo clocks are equipped with high quality swiss musical movements. All carvings are guaranteed made by German master carvers, and all clock cases are solid wood. Every cuckoo clock in our store is not only "Made in Germany" but also certified by the Black Forest Clock Association. A certified original Black Forest Cuckoo Clock has to be hand carved, operate mechanically, use mostly parts manufactured in the Black Forest and has to meet the high quality standards set by the Black Forest clock Association. All our german cuckoo clocks meet or succeed these standards. Hubert Herr produces high quality german brass rackstrike movements, which will ensure that your Black Forest cuckoo clock will run for decades. All our musical cuckoo clocks are equipped with high quality swiss musical movements. 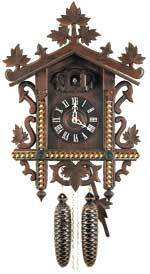 All carvings are guaranteed made by German master carvers, and all clock cases are solid wood.